"To remember history is a fine thing. To create tomorrow's history is something much greater"
The Splendid Emperor, Toturi I, is dead. Though his reign was not always peaceful, he is remembered as one of the Empire's most courageous rulers. He was a man of honour and principles, willing and able to hold together the divisive Great Clans of Rokugan, somethimes through sheer force of will. With Toturi's death, his reign passes to the Empress, the Oracle of the Void. But she vanishes without naming a sucessor, and Toturi's children begin to vie with one another over their father's Empire. The conflict of the Four Winds will shape the future of the Empire. And when one of Toturi's heirs takes the throne, he will find his trials are only beginning. * Complete timelines and histories for over nine years of continuity, describing the Gold and Diamond story arcs of the L5R Collectable Card Game. * NPCs, adventure hooks, and full adventures that will allow you to use this period of Rokugan's history in your own campaign - either as the focus of your ongoing adventures or as background flavour in your own plots. * The setup for the upcoming Lotus - or Dark Lotus - Edition story arc of the CCG and RPG. * Advanced Schools and New Paths, allowing divergant methods of advancement for existing characters or epic Rank Techniques for extreamly powerful characters. This is a sourcebook for the Legend of the Five Rings Role-Playing Game, Third Edition. Players of the L5R CCG may also find it useful as a reference guide for the story arcs presented within. 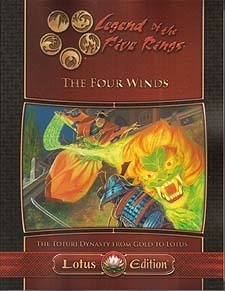 You only need Legend of the Five Rings, Third Edition to use this book in your campaign.